The research arm of the U.S. Department of Defense — the Defense Advanced Research Program Agency, or DARPA — is known for taking on outsize challenges such as this. And so, it put out a call for researchers to figure out a process for making at least 1,000 doses to potentially any pathogen within a week of its discovery. An Arizona State University team was one of the few that rose to the challenge. “As far as we know, we were the only team to figure out how to do this for any pathogen — virus or bacterium,” said research leader Stephen Albert Johnston, who directs the ASU Biodesign Institute’s Center for Innovations in Medicine and is a professor in the School of Life Sciences. “While the system is designed to create antimicrobials in an extreme emergency — which we hope is never needed — the basic elements can be applied to improve conventional approaches to making anti-infectives. ASU scientists have recently met a challenge of developing a new class of antimicrobials, called synbodies, to safeguard the population against infectious threats. But to make antibodies in the lab specific for just one invader can take months, and it can be an expensive proposition. For the past decade, Johnston’s team has been a pioneer in developing lab-made versions that focus on just the business end of antibodies, critical pathogen recognition elements called synthetic antibodies, or synbodies. Stockpiling these 100 peptides in advance means that 1,000 or more doses of a therapeutic could be quickly produced after screening the best candidates that block a given pathogen. These candidates could then be produced in large amounts, purified and tested in mice for acute toxicity, completing the whole process in a week. “We found that the majority of the peptides recognized one pathogen,” Diehnelt said. “The data showed that this array can potentially identify binding peptides for any given pathogen,” Diehnelt said. “With this approach, dozens or even hundreds of synbodies can be produced in a day,” Johnston said. The best candidates are quickly evaluated both for effectiveness and toxicity to humans and can be produced on a large scale. “Our data indicate that a new virus or bacterium can be screened against the small peptide library to discover binding peptides that can be converted into neutralizing antiviral and antibacterial synbodies in a rapid manner,” Diehnelt said. The next steps would be to prepare the final product for an IV delivery, and to scale up the system to produce enough product for a population-wide use — should the next Ebola or Zika or unanticipated outbreak occur. “One key, unique feature of our synbody technology is that the same platform can produce synbodies with direct antibiotic or antiviral activity, and we can do it at a fraction of the potential cost as current, commercially produced therapeutic antibodies,” Johnston said. This is good news: having a plan to save lives in place before the next inevitable outbreak. And for Johnston, who has spun out companies based on other ASU technologies he has developed or co-developed, it could also mean big business. Global therapeutic monoclonal antibodies and cancer therapies are in high demand, with an estimated market size close to $100 billion for 2018. Synbodies are made from two short protein fragments, called peptides, which are joined together to form a small, Y-shaped antibody-like compound still large enough to do its job of warding off germs. Infectious threats like Zika or MRSA can either be viruses or bacteria. Research leader Stephen Albert Johnston's new antimicrobial pipeline can handle either threat in just a week's time. “As far as we know we were the only team to figure out how to do this for any pathogen — virus or bacterium,” Johnston said. Chris Diehnelt is an associate research professor in Johnston’s center who oversaw the lab experiments. Synbodies are selected on peptide chips containing a premade set of 10,000 peptides placed in neat rows on a microscope glass slide, called a microarray. To generate a synbody with antibiotic activity, a solution containing bacteria or viruses can be placed on the microarray, and the best candidates selected. This work was funded by a grant from the Defense Advanced Research Projects Agency (W911NF-10-0299) to Professor Stephen Albert Johnston under the 7-Day Biodefense Program. The class visited a location where lunar rovers were being tested, and for the first time, she heard about aerospace engineering. 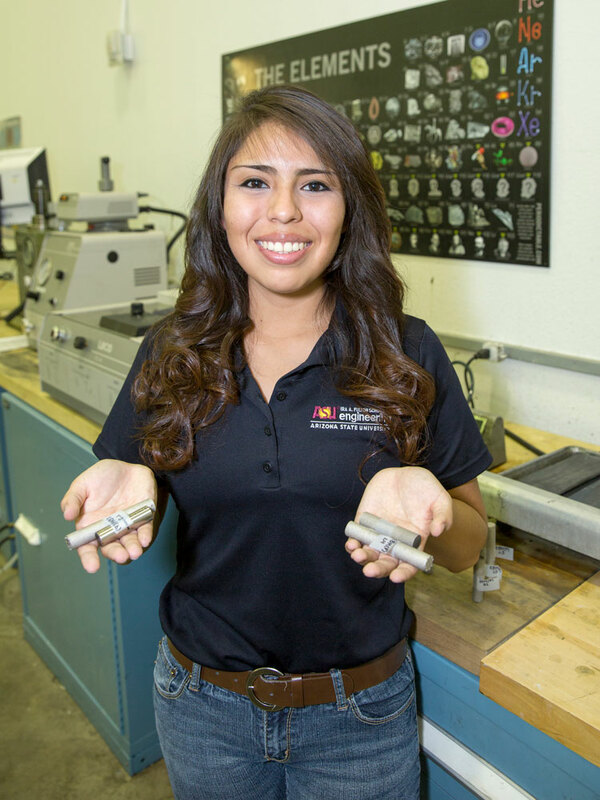 Nez found a perfect fit in the general engineering program at the Arizona State University Polytechnic campus, where the small-campus feel and hands-on methodology allowed her to find her focus. She was working on a project through the NASA Space Grant Internship Program, creating a secondary control system for an underwater robot, when she realized her deep interest in the mechanical/aerospace engineering field. Her biggest achievement was leading ASU’s Next Level Devils microgravity team in creating a project accepted by NASA for the 2017 Micro-G NExT Program held at the Johnson Space Center in Houston. Brittany is also proud of the two years of research she conducted during her NASA internship, work that became the basis of her honors thesis. Nez was the ASU chapter co-president for the American Indian Science and Engineering Society. The group promotes the STEM disciplines to Native American students, a mission she plans to back at the secondary level by supporting AISES and similar groups. Answer: There were several checkpoints in my education that let me know I was on the right path. The first would probably be my first week at ASU. My classes and the people I was surrounded by gave me confidence that I was where I needed to be. Another time I remember feeling this way (was) when I finished my first project with NASA Space Grant because that was the point when I realized that I needed to change my major. The next time was when I started my honors thesis, because I realized that I have other STEM interests besides aerospace engineering. Another major moment was my trip to Houston because I had finally accomplished a childhood dream to see the NASA headquarters. The most recent “aha” moment occurred with my fellowship at Northwestern University where I realized that I have set myself up in a position where, no matter which path I decide to choose, I will always be happy. A: I chose to come to ASU because it had a great engineering program and the program was very versatile. At the time, I did not know which type of engineering I wanted to go to school for, so ASU’s general engineering program at the Polytechnic campus was appealing to me. I really liked the hands-on methodology that the school provided, and I enjoyed the idea of having the small-campus feel of the Polytechnic campus while still having the resources that a large campus would provide at the Tempe campus. A: After graduation, I am heading to Illinois to work for QuesTek Innovations as a materials engineer. In the future, I hope to become a test pilot for NASA. I hope to complete Air Force Officer Training School and become a pilot. I think I want to continue my education and attain a graduate degree in either mechanical or material science engineering in hopes to better my chances of becoming a test pilot.